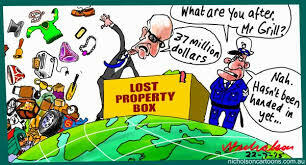 It continues to amaze the authorities in Benidorm the wide range of lost property that is discovered in the tourist capital during the course of a year. The number is in the thousands, and as well as the usual passports, wallets, keys, mobile telephones and credit cards, some strange and unexpected items joined the more traditional list. These have included a 52-inch television, baby buggies, lottery tickets (especially at Christmas), tools, hearing aids and even, a few years ago, a false leg was found on the beach! Add the permanent resident population of mainly Spanish numbering close to 70,000 to the millions of tourists that come to Benidorm, and it’s no surprise at the amount of items that are lost and found every day. Anything found by the Local Police or other council employees are stored and catalogued and the attempt to trace their rightful owners begins. However, many items can remain on the shelves for a number of years without being claimed. According to a report in the Spanish media, so far in 2018 a total of 654 objects have been reunited with the owners of which 281 were found by the police. Throughout last year as a whole, 2,270 items ended up in the lost property depository with August – with 380 – showing the highest number.